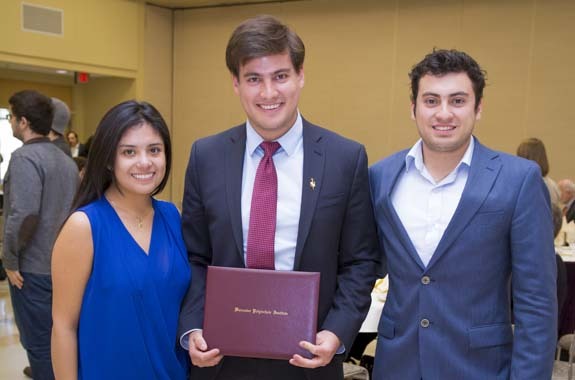 The Office of the Provost sponsors multiple Undergraduate Student Awards every year that are awarded to undergraduates who have demonstrated academic commitment and excellence. Outstanding students are recognized at graduation with designations of Distinction or High Distinction. Students are also recognized each semester on the Dean’s List. Below is a listing of the Undergraduate Student Awards sponsored by the Office of the Provost where you can learn more about the awards and the recipients. Since the introduction of the WPI Plan more than 40 years ago, WPI has recognized its outstanding students at Commencement exercises with awards of Distinction and High Distinction. These awards focus almost entirely on project work and are only awarded to graduating seniors. In 2008, the faculty voted to reintroduce a Dean’s List (PDF) in order to celebrate the exceptional work of our students in every class every year.